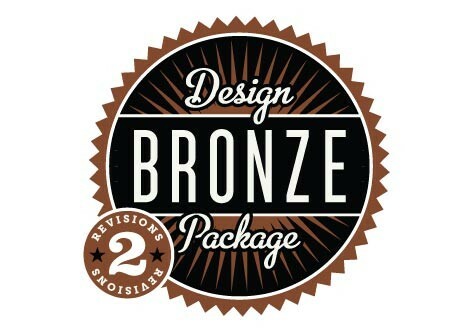 THE BRONZE DESIGN PACKAGE is our ‘entry level’ design option. It offers one custom sign design, including original custom artwork if required. Two design revisions are normally permitted if you purchase this package. This is an economical option to choose if your project assignment is simple, or you already have a logo or initial idea that simply needs to be rendered into a produce-able hand-crafted sign design. This is also a good design package choice if you are happy with the standard shapes, artwork, colors and fonts available on our Danthonia sign design website - but are not the 'do-it-yourself' type when it comes to creating your on design on a computer. Using a template approach our professionals can often get a sign design idea approved within two revisions. The nature of design work is flexible and always includes some back and forth. The two revision limit is not ‘etched in stone’ - but if your project is more complex or you want to ‘explore more options’ please choose one of our larger design packages. "First off, the sign was a big hit. Hubby LOVES it. Thanks! You guys are awesome to work with. I can't believe I go all the way to Australia for my signs but you make them so well and the process is so easy. Thanks so much!"